Flossing is an essential part of maintaining good dental health, and you should start doing it while your children still have their baby teeth. Once teeth start to fit together closely, between the ages of two and six, good dental care habits become even more important. If you start early, flossing will already be part of their routine when permanent teeth arrive. At first they will need assistance, but you can begin teaching your kids to floss by themselves as their dexterity allows. 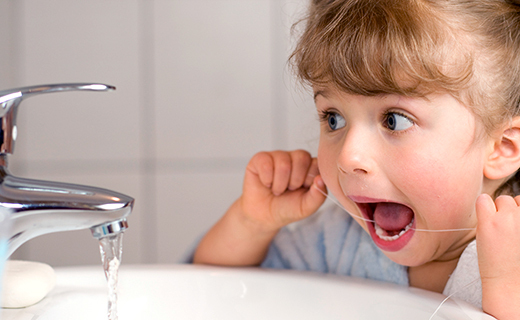 Most children can accomplish flossing alone by the age of ten. Remove approximately 18 inches of floss and wrap it loosely around each of your child’s middle fingers. Leave about one inch of floss between them. Show your child how to slide the floss gently between teeth while holding it taut with a thumb and index finger. Avoid snapping the floss down onto gums. Next, have your child form a C-shaped curve with the floss and move it gently up and down between each tooth and under the gum line. 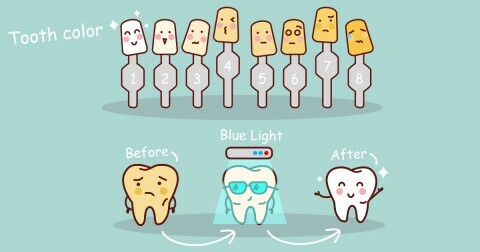 When it’s time to move to the next tooth, use a new section of floss. Don’t be alarmed if some bleeding occurs while flossing. This is common, and should stop after a few days as gum health improves. If bleeding persists or gums become red, swollen, or painful, make an appointment with your child’s dentist in Philadelphia. To learn about our family dentistry practice in Philadelphia, call Gentle Dental of Pennsylvania today at (215) 789-9675 or make an appointment. Gentle Dental offers affordable family dentistry and gentle, compassionate dental care in Philadelphia. With 14 affiliated practices in the Greater Philadelphia area, our offices are conveniently located with extended hours to meet your needs. At Gentle Dental of Pennsylvania, we provide most dental services, from basic preventative care and general dentistry to specialized procedures and complete dental reconstruction. We accept most dental insurance plans and offer affordable financial solutions for any budget. Patient satisfaction is our top priority and we strive to provide the exceptional, affordable dental care and personal touch that lead to lasting relationships. A smiling patient is our greatest reward and we look forward to keeping those smiles healthy, beautiful, and bright. Discover an affordable dentist who truly cares at Gentle Dental of Pennsylvania. I have attending Gentle Dental for the past couple years and my experience has always been pleasant and satisfying. Employees are nice and the doctors are great. All involved in the office/workers are very friendly ad helpful. Tara your dental hygienist is the fantastic, efficient, professional and does a really thorough cleaning and polishing my teeth. I recommend her to all my family and friends! I’ve been coming to Gentle Dental for several years and the staff and service are fantastic. I have been with Gentle Dental for 10+ years. The staff have always taken good care of my teeth. Always receive excellent dental care. Great staff, and my Dentist was the best . The person who cleaned my teeth was extremely sensitive and kind about my dental phobia. I have had numerous procedures at Gentle Dental, and have always had a positive experience with both staff and results.